I. Harold in the Mountains. Scenes of melancholy, happiness and joy. II. Procession of Pilgrims singing the evening hymn. III. Serenade of an Abruzzi-mountaineer to his sweetheart. IV. The Brigand's Orgies. Reminiscenses of the preceding scenes. David Aaron Carpenter rises to all challenges with great dexterity, preserving fine tone and pure intonation in the most (for the viola player) alarming situations. The Sonata (...) lets Carpenter show off his extrovert side, with high-wire acrobatics, and perfectly placed harmonics and double stops . Vladimir Ashkenazy ja HKO on ollut ain inspiroitunut yhdistelmä. (...) David Aaron Carpenter soittaa alttoviulua kuin nuori jumala (...). Carpenter osoittaa teosten parissa jälleen kykynsä ja musikaalisuutensa. Elegantissa alttoäänessä on tarvittaessa myös pintakarvaa. Sinfonian toisen osan (Pyhiinvaeltajien kulkue) murtosoinnut kertovat fantasiantajusta. Alttoviulisti David Aaron Carpenterista lienee kehittymässä soittimensa kirkkain (...) tähti. Paganini's own Sonata for viola and orchestra (...) allows Carpenter to demonstrate his lyrical musicality and bravura. Das Treffen des mit dem Leonard Bernstein Award 2011 ausgezeichneten 25-jährigen Amerikaners (David Aaron Carpenter), Vladimir Ashkenazys, des Helsinki Philharmonic Orchestras und der Ondine-Tontechnik bei Berlioz und Paganini ist eine überaus glückliche Fügung. (...) Seiner meisterhaften Tongebung sowie Bogen- und Grifftechnik, seiner Intonationsreinheit und vollendeten Artikulation (...), überhaupt seinem wirkungsvollen, aber nie Beifall heischenden Vortrag insgesamt gebürt absolute Hochachtung. Päälle tunkevana ajatuksena vankka ammattitaito ja päättäväisyys. (...) Carpenter hurmaa ennen kaikkea Paganinin kahdessa ensimmäisessä osassa taikomallaan värikylläisellä soinnillaan ja hyvin puhtaalla, lavealla äänellään vailla minkäänlaista käheyttä. 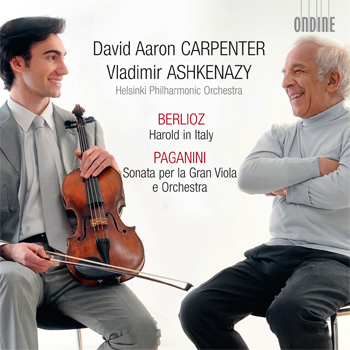 For his second CD release, 25-year-old New York-born violist David Aaron Carpenter is joined by Vladimir Ashkenazy who leads the Helsinki Philharmonic Orchestra. Together they perform the Symphony with Viola obbligato, Harold in Italy, which Berlioz originally wrote on a commission from Paganini. The present recording features, for the first time, a more virtuoso soloist part written for Paganini. The coupling is a showpiece, which Nicolò Paganini wrote after rejecting his earlier Berlioz commission; "The Sonata per la Gran Viola displays the highest virtuosic writing for this instrument," says David Aaron Carpenter, who defines his mission as focusing attention on the viola as a great solo string instrument in its own right. Also included is Berlioz's cheerful Overture to the opera Béatrice et Bénédict. Recipient of the 2011 Leonard Bernstein Award (on August 27, 2011) and winner of the 2010 Avery Fisher Career Grant, David has emerged as one of the world's most promising young artists. In 2006, he won the prestigious Walter E. Naumburg Viola Competition and in 2007, he became protégé for The Rolex Mentor and Protégé Arts Initiative, being the youngest in this mentorship programme's history. David Aaron Carpenter has been the protégé of several major international musical figures, such as Pinchas Zukerman, Yuri Bashmet and Christoph Eschenbach. This release follows on the great success of David's debut recording, with the Philharmonia Orchestra and conductor Christoph Eschenbach, of the Elgar and Schnittke concertos (ODE 1153-2).